After the defense and the round of questions, the PhD Committee deliberated, and Blai obtained an Excellent mark for his PhD thesis. The ICMAB choir sang the "Gaudeamus Igitur", typical after every thesis at the Institute, and Blai's colleagues gave him some presents, before gathering together around the tables. Abstract: We have investigated the physical properties of different systems based on functional transition metal oxides by the use of polarized light. These materials show a large variety of properties –magnetism, ferroelectricity, ferroelasticity–. The driving force of our study has been the understanding of the fundamental physical processes that explain a series of observed phenomena. 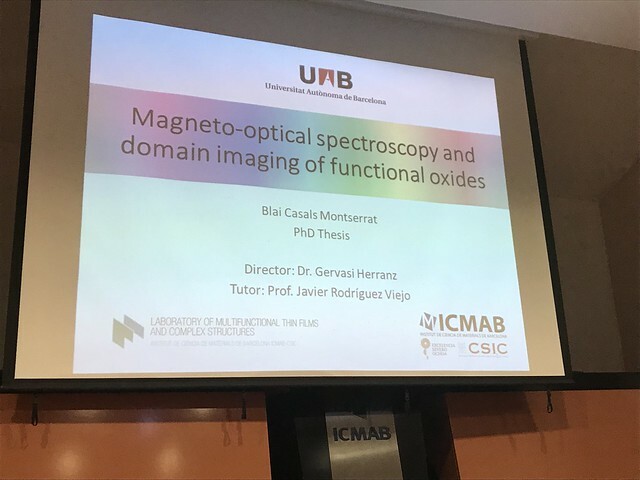 In some cases, our interest has been to understand why a particular material shows an atypically large magneto optical activity; in other cases, why and how ferroelastic domains move under electric fields; finally, we have turned our attention to surface acoustic waves and their interaction with magnetic materials.